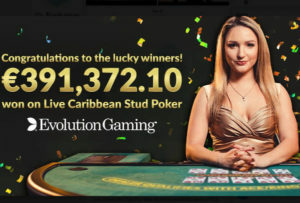 Evolution's €391,372.10 Progressive Jackpot has been won! 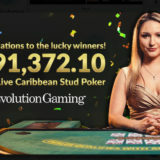 Home » News » Evolution’s €391,372.10 Progressive Jackpot has been won! Evolution Gaming has announced that 7 lucky players won a share of the Live Caribbean Stud Poker progressive jackpot of €391,372.10. That’s a whopping €55, 910.30 a person for the outlay of a €1 bet. The Progressive Jackpot is paid when a Royal Flush is dealt to the players hand. 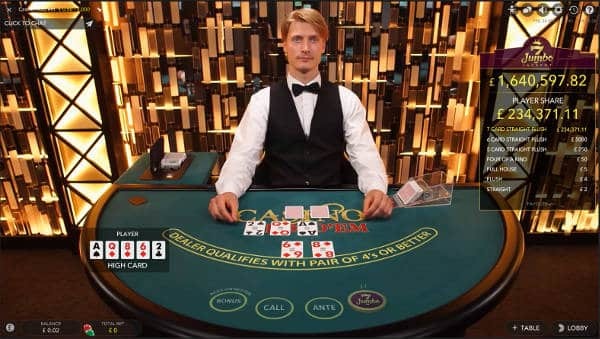 It would appear that the players were playing the Live Caribbean Stud Poker progressive jackpot at Mr Green, Unibet and Grosvenor Casinos. The Progressive Jackpot was first introduced in January 2017 and was seeded with an initial €50,000 euros. 5% of each jackpot bet is then set aside to grow the jackpot which reached €391,372.10 figure in June 2018. 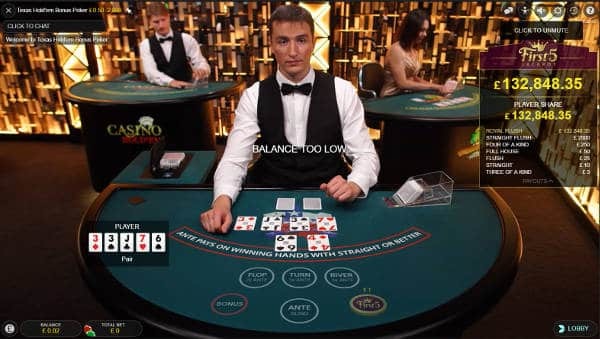 Evolution also has progressive jackpots running on Live Casino Hold’em and Texas Hold’em Bonus Poker. All cost 1 £/€ to play. The current jackpots stand at (refresh page for latest figure). A small percentage of a special or jackpot bet (in Evolution’s case 5% of the bet) is set aside and added to a growing jackpot pool. There is a separate Jackpot Pool for each of the three games running a progressive Jackpot. There are several prizes available to players with most being paid directly to each player when they are won. 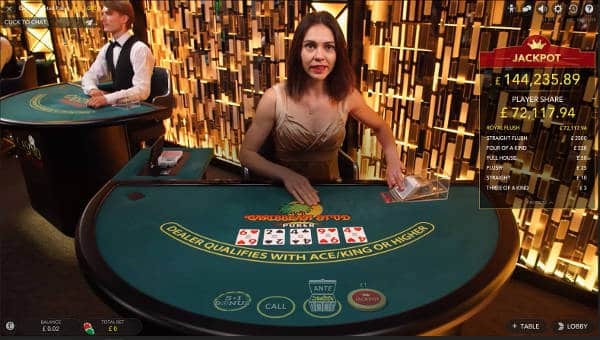 The Jackpot prize for the most difficult hand, normally a Royal Flush, is different, this is split between all the players playing the Jackpot bet when the hand is dealt. When the jackpot is won, the prize pool is reset to an initial value, in the case of the Caribbean Stud Poker Jackpot that figure is €50,000. OF course this Progressive Jackpot falls well short of the largest recorded online jackpot win of €17,879,645. Where can you play the Progressive Jackpots? Not all Evolutions Casinos have opted for the Progressive Jackpots. Fortunately most of the biggest ones have. If your not superstitious then Mr Green, Unibet and Grosvenor Casinos are all good bets. If you prefer playing somewhere that didn’t have a winning player then Leo Vegas and Codeta are good options.